In this internet age, we understand everyone’s attention spans are very short. So we get (even if we’re a little saddened) if you didn’t get to read all the way through my First Ride review of the 2019 Aprilia RSV4 1100 Factory. It’s a couple thousand words long, and though I thought it made for a good read, inevitably some of you didn’t get all the way through it. Thankfully YouTube exists, and while at the glorious Mugello Circuit in Italy, I recorded my thoughts and impressions of the RSV4 for the video you can view below. 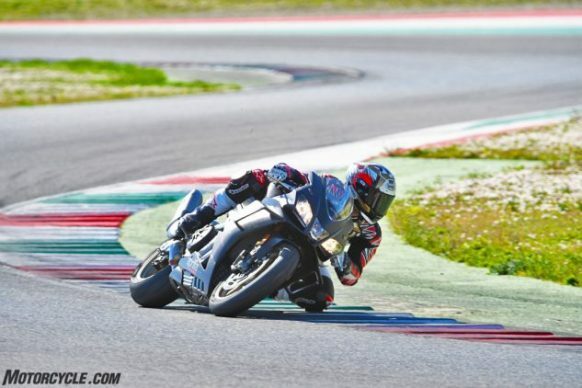 It’s complete with a short overview of the bike and some action footage, including a blast down the 1.1km Mugello straight where the 1100’s speedo flashed 307 kph at one point! Later, my GoPro GPS revealed my top speed to be only 180 mph, but it was still a rush all the same. What’s there to say about the RSV4 family that we haven’t said already? First introduced in 2009, a decade later and the latest iteration of the machine is as relevant now as it was then – maybe even more so. As the name would suggest, powering the 1100 Factory is the 1078cc V4 we first saw in the Tuono 1100 – except different. Compared to the Tuono, the RSV4 uses a different head, cams and pistons, while also incorporating shower injectors, a lighter crank, and several other tweaks to get the RSV4 to not only spin higher than the Tuono, but to make more power, too – to the tune of 217 horses at the crank! Of course, extra power means a few subtle tweaks to the suspension and geometry were made to cope, but the bike loses none of the excellent agility and handling characteristics that have always made the RSV4 a favorite among moto-journos worldwide. Then there are the MotoGP-inspired winglets, which Aprilia claim add downforce and stability at high speeds, which is especially felt during initial braking from those speeds. I cover that in the video also. Full details of the changes can be found in the review link above. Enjoy the video!